So this is kind of about insect immunity. Insects have lots of innate immune responses, the short-term sorts of things that in vertebrates we call ‘inflammation’, but they don’t have the long-term adaptive responses 4 that incorporate antibodies and T cells — those systems arose in sharks and their progeny (and, apparently mostly independently, in lampreys and hagfish,5 but that’s a different story). The hallmark of adaptive immunity, in contrast to innate immunity, is its flexibility: Different responses for different agents, and capable of changing as the target changes. So insects can’t do that, although of course their immune system has worked pretty well for a few hundred million years. Except aphids have a sort of changable immune response. How does that work? This is an immune response, not to bacteria or viruses, but to parasitic wasps. 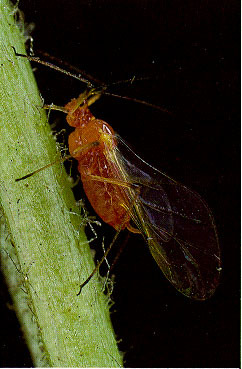 Aphids are popular targets for some of these wasps: The wasps lay eggs in the aphid, the eggs hatch into baby wasps, and the baby wasps eat the aphids from the inside out until they kill the aphid and then they fly away to predate some more. 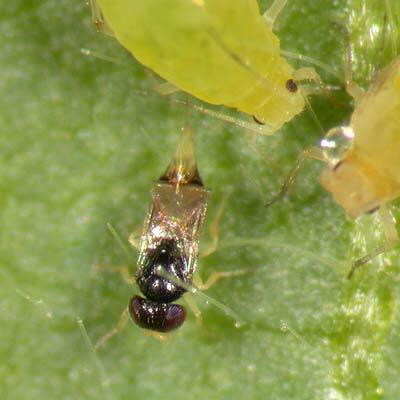 Except in some aphids, the baby wasps are killed as they hatch, and the aphids survives to make more aphids. And this immunity to the wasps is — on a population basis, not an individual basis — rather flexible. Insects in general are good at evolving toxin resistance over years or decades, but aphids have apparently been doing this over millions of years. It turns out that different aphids kill the baby wasps in different ways, using different toxins to do so, and the toxins change over time as well. So the wasps can’t develop resistance to the toxins. It’s a little bit — a very little bit — like an adaptive immune system, at least in broad terms. Not all aphids are immune at all (or there would be no wasps). You can take susceptible aphids and make them resistant, though. You just have to infect them with a particular bacterium. This is a symbiotic6 bacterium, that only lives in aphids — it’s dependent on the aphid host to provide it with essential nutrients — and these bacteria carry toxin genes. They help their host survive by providing toxin genes, that kill the wasps that parasitize the hosts the bacteria are symbiotic with. But not so fast! The bacteria don’t naturally have toxins! The toxins come from parasites of the bacteria! There are bacteriophages, viruses that infect the bacteria, that carry the toxins. When the viruses parasitize the bacteria that are parasitizing the aphids, then the parasitic wasps can’t parasitize the aphids that are hosting the bacteria that are hosting the viruses! And if you look at the bacteriophages as a population, they have a section of their genome that is highly diverse. That part is the region that carries the toxin. Different phages, different toxins, that can spread to new bacteria and then to new aphids, so the aphids can have a supply of new toxins to take care of newly-resistant wasps. Just to make this even more complex, you know how the wasps subdue their prey? They inject in a complex mix of toxins that shut down the insect immune system. Guess where those toxins come from?7 From the symbiotic viruses8 that the wasps have incorporated into their own genomes millions of years ago, that carry immune evasion genes that the wasps have adapted to use to subdue the aphids that carry the bacteria that carry the viruses that provide the toxins that protect the aphids against the wasps that carry their own viruses to attack the aphids. Invertebrate memory, or wishful thinking?